I have discussed often, e.g., here, and here, that Guinness stout used to be a naturally-conditioned beer. This meant it was racked (transferred) to wood barrels, or bottled, with its residual live yeast. In brewing, much of the yeast which has turned the maltose into alcohol and CO2 is removed in the traditional process. Some always remained, sometimes throwing a haze unless the beer was left to stand for a while or certain clarification methods were used. During the 1960s, the draft system more or less employed since the inception of Guinness in the 1700s was replaced in Ireland. The beer was now filtered and chilled (later pasteurized, too) and dispensed from a metal canister by a mix of CO2 and nitrogen gas. This was a technical innovation of some sophistication. The unfiltered bottling was retained for about 20 years still, but finally this form too was eliminated. All bottled and canned Guinness has been filtered and pasteurized for decades. Beer containing residual yeast, especially where dispensed from wood containers in which bacteria and wild yeast could lurk, is liable to deterioration in various ways. Obviously Guinness’s fame meant most pints must have been sound during its lengthy history, but the brewery wanted to promote a greater level of stability. The new system ensured this. In general, similar technological changes were occurring elsewhere in brewing. Indeed most large plants had become “sterile” (in the technical sense), a change also meant to favour product stability and consistency. Guinness adopted this as well. We have always wondered how Irish bar customers reacted to the new form of the beer. There must still be people in Dublin today who remember Guinness before the switch to the current system. To me, it is interesting to glean their thoughts from a palate or “gastronomic” standpoint. In a word, did any of them notice a change in taste? Was the new form different, if so how? Today, in the wake of the craft brewing renaissance, many beer fanciers would state they prefer beer in unfiltered and unpasteurized form. Was that the case for the beer fanciers of 1960s Dublin, or some of them? I’m no expert. I do remember Guinness from the old days. It came in barrels as you describe or bottles. Draft from wooden barrels was very creamy and had a nice head. You would find it not cold or even warm. The bottled beer which I preferred had a malty flavour. It was served unchilled, mostly. From the fridge might have been an option, however most bars would not have been so modern as to boast a fridge. The main change with the metal casks was the beer came out cold. Soon most drinkers wanted it that way. I would have been in my late teens when the changes were introduced. I preferred the old products, however one got used to the new. Later, I asked Edwin if he recalled that any customers grumbled about the change. He said for a time, you could get Guinness in both forms in the city, so both tastes were satisfied, but finally the old system was phased out and people just accustomed to the new form. Although he didn’t say this, I’d guess that some who really liked the unfiltered character of the old draft switched to bottles, since bottled Guinness remained unfiltered for a considerable time as I said. The takeaway for me is, even in the great beer-drinking country of Ireland, people just accepted over time changes in their beer. And it was true elsewhere. In eastern Canada before WW I, ale was still a strong beer, c. 7% abv, and aged in the cellar for months, similar to its model of English stock ale including India Pale Ale. By the 1920s, the norm in Quebec and Ontario had become cold, fizzy, medium-strength ale (5% abv). People accepted the change and there is reason to think many welcomed it. It’s the same with milk – I can just recall that some bottled milk – it came in large, skittle-shaped bottles – had a layer of cream on top. Who remembers that now or cares? It’s an old story though whether a brewer or any supplier of comestibles responds to or creates the public taste. The answer probably is, it’s somewhere in the middle, a complex process where each factor has more or less influence for various reasons. For example, by the 1970s England was characterized by relative prosperity, better communications, and a more assertive public. The favoured the creation of The Campaign For Real Ale, or CAMRA. CAMRA’s lobbying ensured the preservation of English cask-conditioned beer. CAMRA also helped spark the craft/indie brewing renaissance underway for the last generation, now internationally. CAMRA was called by renowned brewing writer Michael Jackson Europe’s most successful consumer movement. CAMRA started about a decade after Guinness implemented its new draft system in Ireland. Perhaps had Guinness waited another 10 years a campaign to save the old Guinness would have started. But regardless of that, changes for a mass-produced product like Guinness were probably inevitable. Had an Irish CAMRA existed in 1964, at most maybe a small supply of naturally-conditioned Guinness would have been assured. That would have been valuable unto itself, though. Edwin’s comments about temperature are interesting, and probably reflect the typical reaction of the day. Probably too in practice some pubs served the new beer warmer, or arrayed the glasses on the bar to let them settle and warm a bit. So any temperature/palate needs of a specific clientele were probably handled that way, or by people switching to the bottled form as I said. Net-net, people took to the new Guinness. Today, the need for a cask-conditioned Guinness is less strong. Ireland now has a few dozen small, independent breweries, spawned in the wake of CAMRA and the success of U.S. craft brewing. Numerous of them make a stout or porter in the old way. The history took care of itself, finally. N.B. Guinness is starting to address the demand for more distinctive – and historical – forms of its famous stout. The porter pictured, which I found in Paris recently, is a first-rate product albeit not bottle-conditioned. One hopes it will be sent to all important markets for Guinness internationally, including Ontario. It’s been out for a couple of years though, and I haven’t seen it here yet. 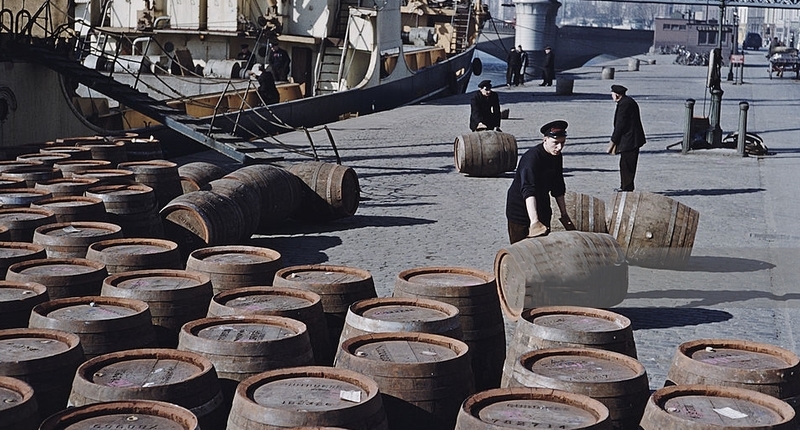 Note re image: the second image above shows the handling of Guinness casks on a Dublin quay in the mid-1950s. It was sourced from Pinterest, here. Image is used for educational and historical purposes. All intellectual property therein belongs solely to its lawful owner or authorized user. All feedback welcomed. Just as an aside, I am also interested in WWII history, and I am somewhat sceptical that Guinness was being exported into Antwerp in 1944. After very hard battles in South Beveland and Walcheren at the mouth of the Schelde (c.27,000 Canadian casualties) the Port was finally opened on Nov 28 1944, so if any beer was sent, surely it would be for Allied troops not the civilians. Consider too, that the V-2 campaign against Antwerp commenced on Oct 7 1944 – over 1,600 hit the city between then and March 1945, more than hit London. So it seems a somewhat curious choice of name, at least to me. On the website of (what is now called) Anthony Martin, the same code is mentioned, GSX. I am not clear if this is a Guinness extract (hopped wort reduction) or the racked beer but in any case, Martin was bottling and selling this from before WW I. All Guinness was all-malt then. If you page through references to Martin and Belgium in the book, Martin also states when the second war started, Guinness closed the agency in Antwerp and all records were moved to London. John Martin still markets Special Export in Belgium, which possibly is all-malt. Guinness sells its Antwerp 1944 one which I think is the same recipe. One online review likens the 1944 Antwerp to Carnegie Porter which is high praise. I know Carnegie and Guinness Special Export as I recall it from 20-30 years ago was similar to Carnegie. Yet in 2011 in Paris I bought Special Export and didn’t like it, but I’m not sure what I had was the Belgian one aka 1944 Antwerp Stout, maybe it was just a stronger version of Extra Stout (Original). Gary, you will interested I am sure, that Guinness UK are now distributing something packaged as ‘Guinness 1944 Antwerpen Stout’ (8%ABV – BB 15/08/2018) in 330ml bottles – I nabbed a couple in my local TESCO (giant UK supermarket chain) for GBP2.00 each. No mention of bottle conditioning. ‘Brewed in Ireland’ says the label. Claims to be ‘a secret pleasure among beer connoisseurs’ and to be exported through the ‘vibrant Port of Antwerp’ since 1944. So identical to the famous brew for exclusive Belgian market, apparently. First impressions on a cold one from the fridge are as a not particularly complex beer, somewhat ‘chewy’ in the mouth (good), pleasant enough with the warming alcohol providing a solid base. But not like the sour and complex melange I remember from my last purchased in Belgium actual FES Belgian version (8.8%ABV from memory), 8-10 years ago. Ben, thanks for this, I recall a discussion on Twitter of this label.The beer appears to be the Guinness Special Export formulation, i.e., under a different label but it’s not 100% clear (or to me). I had Special Export 20 and 30 years ago when I felt it was first-class, rich and malty. A tasting in France some years ago was disappointing though, it seemed thinner and just a stronger version of Extra Stout or the widget one. It’s always hard to know and I don’t like to base impressions on one tasting, so I’d certainly try this new label. There is of course Guinness Foreign Extra Stout, certainly a decent beer but not in the league of most craft stouts and porters. 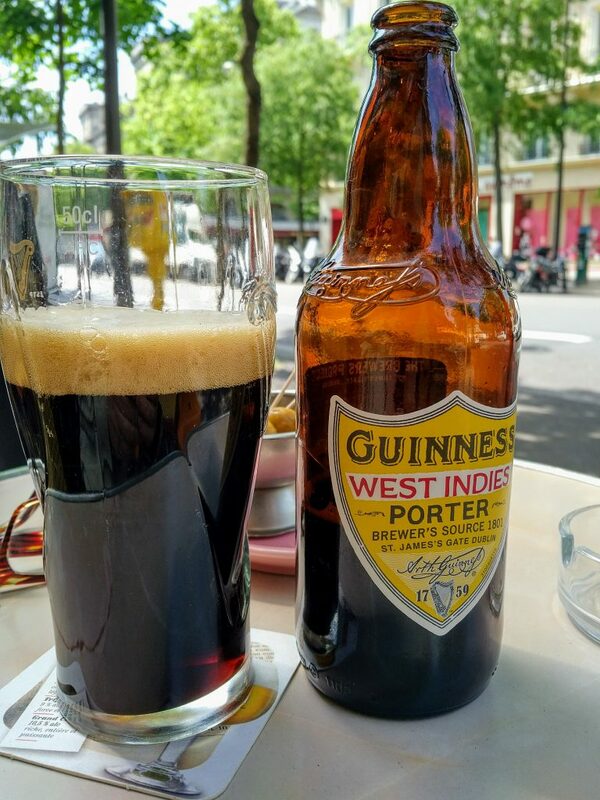 The Guinness West Indies Porter is the best bottled beer so far in the line, IMO. Short of an all-malt bottle conditioned Guinness, I’d be quite happy with that one but it is hard to find, in fact I haven’t seen it in North America although I understand it is sold in some stores here. It’s interesting that the founding of CAMRA was inspired by drinking (pasteurised/kegged) Guinness in Ireland and wondering why English brewers seemed unable to manage this process. It has been said that if in the 1960s/70s English ale brewers had been able to pasteurise and keg their product as well as Guinness did, CAMRA might never have come into existence and the traditional product would have slipped into memory as easily as it did in Ireland. Thanks for this. But there’s an important point though, maybe two. At that famous conclave of the four, the Guinness draft was almost certainly unpasteurized. Pasteurization came later, I think in the 1980s. In Britain, the draft was always pasteurized, or almost always from what I’ve read. The lack of pasteurization in the keg Guinness may have helped it to stand out, just as modern craft keg stands out. Second point, or rather query: was Guinness still all-malt then? (Look at my post today by the way). I understand regular Guinness has something like 40% unmalted barley today. That’s a lot. Was it the same circa 1971? Even if adjunct was used, I’d guess less was used than today. So these factors may have contributed to the presumed impression of high quality. We know in any case that all-malt, craft keg today can be great, and I agree with you that English brewers missed an opportunity then. That 70s keg beer, and some of it is still around as you know or essentially the same thing, was often not very beer-like, which excited the dudgeon of CAMRA and others. I assume this was due to high adjunct, low hopping, and perhaps the pasteurization, or excess pasteurization.